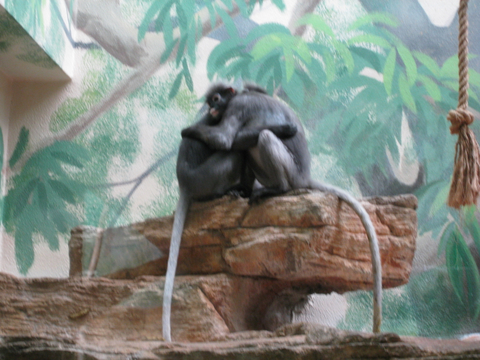 About 2 minutes after these langurs ceased fighting, I saw what clearly appeared to be a reconcilation. Here’s the progression. 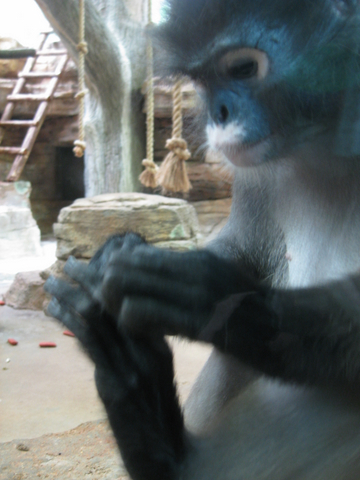 For most of the two minutes immediately following the fight, one of the langurs parked himself about 3 inches from me (separated by plexiglass). I wondered whether he was pouting or, maybe, whether he was a bit hurt. He looked to be checking out his foot. After 2 minutes, he hopped up to a outcropping to join the other langur, where the two fighting langurs hugged for about 60 seconds. I not certain I know how to interpret what happened next, but here’s the photo. It appeared to be of a sexual nature or, perhaps, grooming. 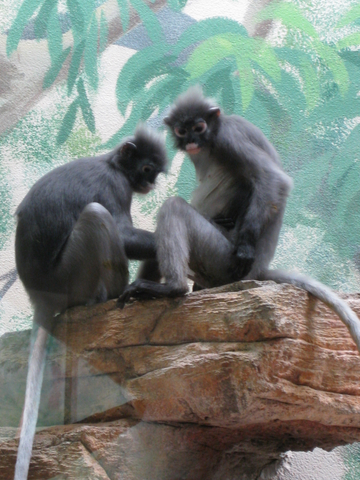 Langurs are marvelously athletic creatures. They bounce around in their enclosure, sometimes causing themselves to bounce off of the Plexiglas. They can jump up cliffs and grab ropes and swing without any apparent fear or effort. 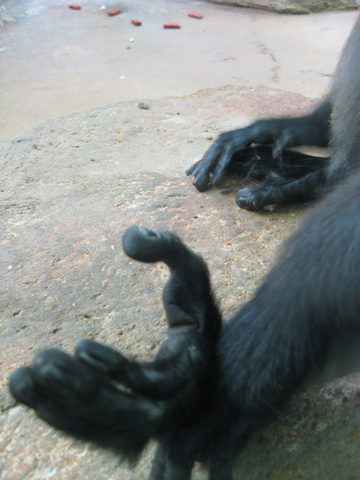 Check out the toes of the langur, which are much longer then the langur’s fingers. I found this fight/reconcile exchange to be fascinating, especially in light of Frans de Waal’s discovery that primates often reconcile. He noted that these reconciliations often involve an expression of sexuality. I assume that this is what happened today. How does fighting them over there save us from fighting them over here? Dan Choi: Love is worth fighting for. « 온라인 슬롯머신Please don’t send me any store-bought greeting cards!